Synopsis: Mindsets that miss out; examples; here and now "distracters"; those good at here and now love; giving here and now love; now for the future; a helper test; Joy and sorrow in the now; training yourself. Love is best experienced with a "here and now" mind-set. That takes focusing your awareness fully in the present while love is being given and received. It is surprising how difficult this is for some people. So many miss out on full, love experiences because their mind is focused on something from the past or the future and, therefore, not in the "now". Let’s look at a few examples. She gives him a loving kiss but his focus is on problems at the office so he does not fully feel the love coming to him. He, ever so lovingly, smiles at her but her mind is on making sure their children clean up their room so her subconscious sense of loneliness grows a bit bigger. Out of love the small child puts heartfelt effort into making a picture present then gleefully hands it to the parent. However, the parent’s mind is on the issues of tomorrow and barely looks at the gift and quickly dismisses the child’s special made, love gift and the child. The parent misses the feeling of love coming from the child and the child misses out on the receptional love the parent could have given in return. Plus, the child may learn disappointment is what comes from trying to give love, and they might be being ‘taught by example’ how to not receive love offerings fully. A friend gives a loving compliment but the intended recipient almost doesn’t hear it at all because that person is focused on whether or not they did the right thing about yesterday’s difficulty. I bet you can think up your own examples and personal experiences. So often people grow "love starved" because they are inexperienced at living in the here and now. Lots of people need and want more love and, in fact, demonstrations of love may be coming their way. However, they’re missing out on the nourishment of that love because they’re not good at switching into a "here and now" focus. So many are so occupied with anxieties about the future or painful incidents from the past they don’t see the enriching, strengthening love available to them in the present. Many have love opportunities surrounding them and all they need do is ask for a hug, or a smile, or to be lovingly listened to for a bit and they would get the love that’s available. Then they could go about life a little better because love well received usually helps counter pain from the past and anxieties of the future. Of course, there are appropriate times for making plans for the future, and acceptable times to be learning from the past, and busy times too. But if love is available, or being offered, don’t miss out on it even if soaking it up needs to be brief. This is where the "quality of reception" is more important than the "amount of time" spent. Some people are really good at"here and now" love. They see loving looks coming their way and fully absorb and are nourished by those looks. There are those who delight in a lover’s hand as it warmly slips into their own, and their mind is on that and that alone. Well loved are the ones who don’t give a rapid, perfunctory “I love you too” reply to an “I love you” statement. Rather, they allow themselves to feel the love just sent their way and in essence digest and are nourished by it before they make a heartfelt reply. They are more likely to say something like “Thank you, that feels so good, and I’m really glad you do” rather than giving an automatic statement without much feeling. For some, getting and giving loving hugs spark and spice up their lives. For others hugging is a quick, empty ritual because their focus is away from the here and now. Here’s a question. 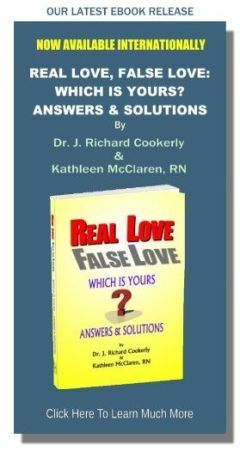 Do you think those who are really good at really focusing their mind on each love event, as it occurs, live better? And if you aren’t already doing that do you want to be one of them? Another part of "here and now" love has to do with not missing out on here and now opportunities for giving love. I like to recommend demonstrating your love often and much. Love is one of those things that the more you give it away the more you have to give, so long as you remember to give enough of it to yourself too. To give love often and much you have to work at not letting too many distractions from the past or about the future get in the way. Say words of love with loving tones, give looks of love, touch with love, and frequently do all the ways of demonstrating love and I’m betting you’ll be so glad you live that way. Watch out that you don’t let the fear of doing it poorly, or the fear that it will not be well received, or things like that stop you. When it comes to love it usually is better to make a mistake of commission rather than one of omission. 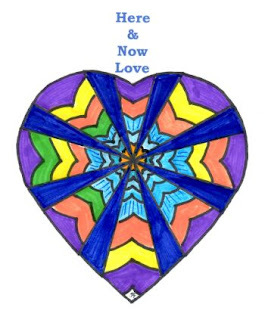 Do you know how doing well with "here and now" love improves your future and how that works? First, when you really soak up love and allow yourself to fully ‘get it’ you change your brain chemistry for the better. Then improved brain chemistry changes your body chemistry for the better. This means your immunity mechanisms fight off infections better, and fewer stress hormones are produced and your aging process is slowed. Also your improved brain chemistry produces more good feeling neurochemistry, generally helping to make you happier and more positive about yourself in life. All this means you are more likely to live longer and enjoy life more. That’s not all. When you get really good at "here and now" love you store up good feeling memories that later you can draw upon to help you get through bleak and bad times. Those who only ‘sort of’ feel loved when it’s coming their way may be much more likely to experience depression, despair, hopelessness, etc. Those who do really well at encouraging"here and now" love to come their way are usually better at giving love. This makes for more generating of mutual love and cycling of love in relationships. The more love generated in a love relationship the better and healthier the relationship is likely to grow, and the closer the participants are likely to feel toward one another. That means you and those you love will be more bonded and are likely to experience being more energized and also more loyal to each other. Here is a little helper test. Wherever you are right now, look around and see something you can feel, at least a little positive about, that you might not have really noticed before. Now listen closely and try to hear some sound you didn’t notice until right now; especially listen for sounds that you can be at least a little interested in. Now touch something, preferably pleasurable, and feel its texture more fully than you have before. In every environment there always is more you can notice and at least mildly like in a "here and now" way. Now, think of doing the same things with someone you love. See something more, hear something more, and feel their textures more. Be aware that as you do this you are more fully perceiving precious parts of your valued loved one. With that awareness you might want to tell your loved one that you are enjoying and appreciating them right now. After that do the same with yourself as an act of healthy self-love. Notice that if while you’re doing this your mind goes anywhere else, to the past, future, far away, etc. yank it back. You can force your mind to be in the here and now when finding things to be at least a little positive about and, therefore, to enjoy. One of the best and greatest joys in my work happens when I hear couples, family members, friends, etc. say things like “I feel so loved right now”, “We are really doing our love and it’s great”, “I just have to hug you right now because I’m overwhelmed with feelings of love”, “Finally we’re all really loving each other in such good ways, and it’s the best thing in the world”, “At long last I love myself, and I know I’m really okay”. One of the saddest parts of my work as a psychotherapist comes with those who lost a loved one like a child, spouse, family member, dear friend, etc. and I hear “I wish I would have told them I loved them more”, “We didn’t spend enough time loving each other”, “We never took enough time out of our too busy lives to love each other like we could have”. With some work you can train yourself to pay attention to the love coming your way in the here and now and really get it. With repeated effort you can notice your here and now opportunities to give love and you can do so. You purposefully can yank your mind away from the future (and get back to it later) when you have a ‘here and now’ love opportunity. Likewise, you can yank your mind away from the past when there is a "here and now" opportunity to do love, grow love, experience love, etc. (and later return to whatever you were thinking about from the past). With some work we all can be better ‘here and now’ lovers. Hopefully with these thoughts in mind you will do "here and now" love a bit better and a bit more often. As you do that remember to tell yourself here and now “Good for me” and other healthy, self love statements. ♥ Love Success Question In the next 10 minutes who will you show some love to, and how will you do that? Remember, it’s OK if your love target is yourself.